One of our side projects is a collaborative drawing/painting tool, it’s pretty nifty and is a lot of fun to use. Have a go yourself below..
What’s new in Etherpad since Google’s acquisition? TLDR; Etherpad has changed a lot over the last few years, you should check out some of the great new stuff. There has been a lot of progress in Etherpad but you might not know about it all because the instance you are using might be old and out of date. We wanted to make it easy for you so here is what’s new in Etherpad since we went open source nearly 5 years ago! Client side plugins extend the editor functionality with excellent user experiences such as video conferencing, rich text editing, images, tables, comments, markdown, LaTeX and so much more. On the Server side hundreds of plugins extend Etherpad including support for email notifications, pad management, authentication.. The list really does go on so you should open it in a new tab and check it out when you have a few minutes spare! Etherpad provides an admin page which provides functionality to edit settings, check your instance settings and manage plugins. Best of all the admin page is super quick and easy to use, similar to how WordPress does plugin management. From High Resolution screen support to screen reader support to Internationalization (Translations) to Keyboard shortcuts we’re really keen to improve accessibility on the front end. On the back end various well documented clients and libraries for both the API and editor all supported by excellent Etherpad core documentation. We have also focused on document portability ensuring your ENTIRE pad including every single edit(and it’s history) can be exported and taken from one Etherpad instance to another, something no competitor offers. The “old” version of Etherpad was stable up to about 20 people on a pad, after that things got a bit shaky. We’re now testing up to about 250 users on a single pad, way beyond what competitors can offer. We now provide both automated front-end and automated back-end testing for Etherpad. This has helped uptime instances be way within the 99.9% threshold required by most operators. While we’re constantly improving on this we’re really proud of the latest figures (99.993% up-time) across our enterprise supported instances and we hope to keep pushing for even better stability moving forward. You know what commercial services are, if your company is using Etherpad then you probably have an internal guy that’s your Etherpad guy. Without that guy we wouldn’t exist as a project so here is an opportunity for us to say thanks! If you are that guy and you feel like you would like some support with your Etherpad instance do get in touch and we’d be happy to connect you to someone that can help. If you are a developer or admin and enjoy working with Etherpad then also get in touch, we can connect those dots too! Shut up and take me to Etherpad! IMPORTANT: Security release, please update your instances! This is another security release, the exploit is documented as CVE-2015-3297 — If a specifically formatted URL is used to access Etherpad a file can be read from the filesystem. This issue has existed in Etherpad since 2012 so pretty much all deployments will be effected. We have been doing a lot of security releases lately as we complete our third security audit. Our apologies for creating such a fire under admins to update so frequently lately. NEW: Default Pad options can now be defined in settings.json, see the Etherpad Template file for reference. NEW: sessionKey is now automatically generated and stored in the file system. This is our final release before we introduce some breaking changes over the weekend. This release includes one critical security fix which can expose a file from your file system to a remote visitor. CVE due soon. Today we’re proud to announce that Etherpad is now accessibility enabled. pvagner for all his input and testing..
Alt F9 brings up the context menu, Alt F9 and Escape returns focus back to the pad. I spotted something that’s wrong or I think it can be made better, how can I tell you? When will see accessibility land in a major release? We’re hours away from starting our 2015 hackathon which should bare the fruits of a major release so hopefully a major release will land within 48 hours of this blog post however if you are itching to get your mitts on Accessibility features simply checkout the Etherpad develop branch. Nginx by Default with Etherpad will display the Nginx Server name value and not forward the Etherpad Server name value. This is a problem as it means your Etherpad version is not available in the Headers which makes debug more difficult among other things. Check by restarting Etherpad and checking your headers. Here’s some plugins you can use to enable Etherpad to be useful for academic writing. 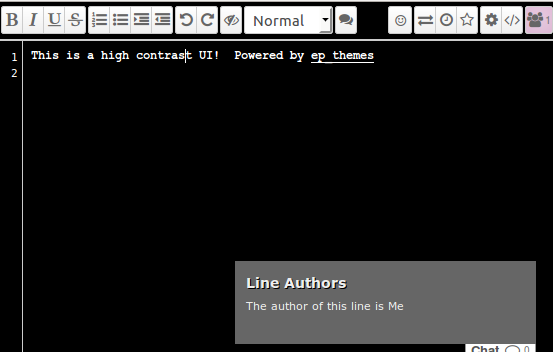 All founds on the Etherpad plugin page with minimal effort. Privacy: Take your pick from the plugin page.